Ever since he was 12, David Archuleta has already been singing in different episodes of Star Search. He also appeared in various shows such as The Jenny Jones Show and CBS' The Early Show. However, his popularity literally skyrocketed when he became the runner-up on American Idol's 7th season. David recently released his self-titled album, which became an instant hit and reached number 2 in US charts. 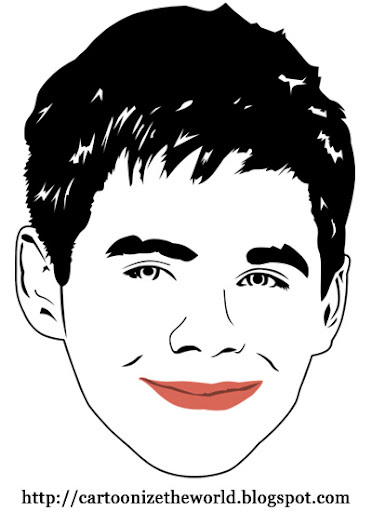 Sorry Arch Angels... but David Archuleta, you've been cartoonized. If you have not yet subscribed to our mailing list, be sure to do so now! Not only will you get a free wallpaper from Cartoonize The World two days from now, but you will also receive frequent updates on the latest cartoons! Just enter your e-mail address in the form below, and click subsribe! I am a proud Arch Angel/Archie/whatever else you want to call me. You are very talented! Love David's cartoon. Yep, that's our David, thank you! It looks exactly like David!! wow!